Timeline.js helps you create beautiful, interactive, easy-to-use timelines for your website. This library will help you tell, illustrate, or support stories that are strongly based on time with a series of events. Timeline.js allows you to easily add information quickly from a number of sources, including tweets from Twitter, videos from YouTube and Vimeo, images from Flickr, maps and location information from Google Maps, and audio from SoundCloud. The library will also help you add text from Wikipedia, as well as information from Vine and Dailymotion. Timeline.js will then build your timeline, formatting this information and creating a clean, easily understood timeline. Timeline.js is open-source, available on GitHub, and is available in 40 different languages. This tutorial gives examples of code to use to build a timeline with Timeline.js. It shows how to build the timeline with JSON-formatted data data, and how to add the timeline into a HTML page. 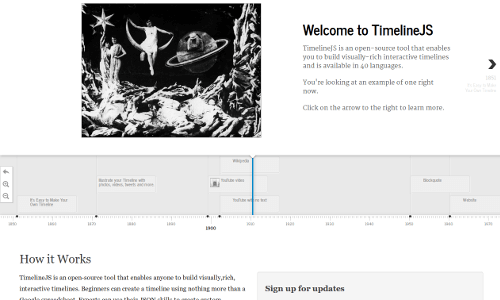 This introductory tutorial shows how to add and embed a timeline on a webpage with Timeline.js. It briefly explains the directory structure of the Timeline.js library, and how to use it when hosted on your web server. This tutorial explains in detail how to create a timeline using Timeline.js. Aimed for people creating a timeline for their work or experience, it explains the HTML structure of a page using the library, then details how to customize the timeline’s appearance with CSS. This brief tutorial explains how to quickly create a timeline with Timeline.js. It shows how to add and format the data for your timeline in a Google Spreadsheet, then how to publish the spreadsheet, and finally how to generate the timeline and add it to your page.